This new Tizen OS-powered smartwatch comes in two different options and features a rotating bezel, as well as Home and Back buttons. After a long time in the rumor mill and a few official teasers, a new iteration of Samsung's smartwatch has been finally unveiled. Samsung claims the Gear S2 is "a result of many years of progressive innovation in the wearables category." This smart wearable has a circular design with a unique rotating bezel, as well as Home and Back buttons. All the new Samsung Gear S2 wearables have been IP68 certified for protection from the elements and feature wireless charging, promising up to 3 days of autonomy. 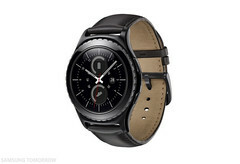 Although Samsung mentioned a 1 GHz dual-core processor for all Gear S2 models, the official product page claims the 3G version is powered by a Qualcomm Snapdragon 400 that usually runs at 1.2 GHz. The new Gear smartwatches will be shown at IFA 2015 starting tomorrow. Pricing and availability details have not been unveiled yet.